Composer Glenn McClure in Antarctica. Courtesy photo. Deep within the ice shelves of Antarctica, there are stories—and musical compositions—to be told. Composer Glenn McClure recently teamed up with researchers at Scripps Institution of Oceanography at UC San Diego and Birch Aquarium at Scripps to transform Antarctic ice shelf vibrations into unique musical arrangements. “What I want to do is to give a voice to the ice,” said McClure, a faculty member at SUNY Geneseo and Eastman School of Music. Bromirski and other scientists are interested in the 800-kilometer (500-mile) wide Ross Ice Shelf as it’s the largest in the Antarctic and a region destined to be greatly impacted by the effects of climate change. The front of the Ross Ice Shelf is directly impacted by ocean waves, which send vibrations throughout the ice shelf. Similar to how a beating heart sends a pulse throughout the body, ice shelf vibrations can be used to help assess the health—the structural integrity—of the ice shelf. 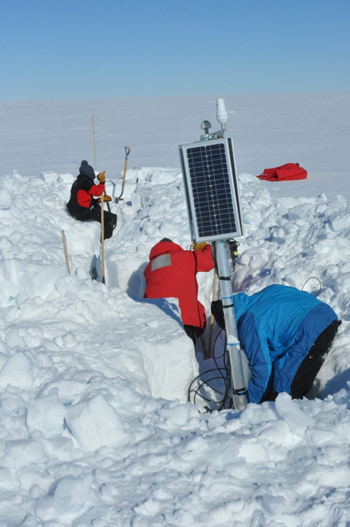 In 2014, Bromirski and colleagues deployed an array of broadband seismometers on the ice shelf surface to measure the amplitude and speed of these vibrations. McClure assisted the research team with the retrieval of these seismometers in the austral summer (October to December) of 2016. He is now using modular mathematics to translate the data collected from the seismometers into symphonic works. The work is deeply personal for McClure, who is afflicted with severe stutter but has learned ways to control his disability through music. McClure contacted Bromirski after learning about his research on ice shelf vibrations, and after several discussions, the two decided to collaborate. The resulting musical compositions from McClure’s project will be incorporated into the second phase of a new immersive exhibit at Birch Aquarium at Scripps, titled The Expedition, which will likely open sometime early next fall. In addition to hosting live musical performances featuring McClure’s work, the aquarium plans to use some of his photographs, videos, and audio clips from Antarctica for part of a forthcoming polar exhibit called “Footprints in the Snow.” This exhibit will highlight Bromirski’s ice shelf research and will connect aquarium visitors to science at Scripps. Visitors of the new exhibit will be able to see seismic instrumentation used by Scripps scientists, view recorded footage of incoming Antarctic storms using virtual reality, and hear crunching sounds from footprints in the snow—as recorded by McClure—with each step they take inside the space. McClure’s “home base” in Antarctica was on Ross Island at McMurdo station, a science and research facility that houses up to 900 people. He was surprised by the amount of music and art that happens at McMurdo station. He spent a week camping on the Ross Ice Shelf at an isolated deep-field site called Yesterday Camp—appropriately named because the camp is located near the International Date Line, so the clock-time is a day earlier than McMurdo. Yesterday Camp was the central base for McClure and the Scripps-led research team as they spent their days digging seismometers and GPS instruments out of the ice—hard work that involved lots of shoveling. There aren’t any geographic markers to figure out which direction one is facing at Yesterday Camp, and McClure described the experience as disorienting. “The sun does a circle in the sky so you never really know what time it is if you don’t have a watch on. When the snow blows or the fog comes in, you can’t even see the horizon anymore, so you can’t tell where the land stops and the sky begins,” he said. Despite the sense of disorientation, McClure said he found the overall experience to be quite liberating and that it changed the ways in which he views the world. McClure is thrilled to have been given the opportunity to cross-collaborate with Scripps on this project in which he’s pushing traditional boundaries in efforts to fuse science with art. He is greatly looking forward to showcasing this innovative work at Birch Aquarium and across other platforms.